Restoring your smile's function and beauty. Considering dental implants in San Francisco? We are here to guide you every step of the way. Dental implants are an ideal solution for missing teeth. But how do they work? Dr. Pasquinelli and Dr. Olivares are here to answer all your questions regarding this life changing procedure. Your natural tooth consists of a root hidden below the gum line and your tooth that sits on top of the root. 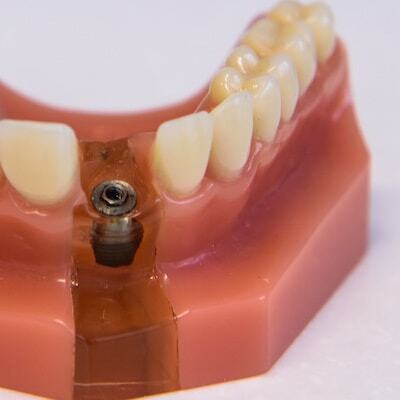 A dental implant consists of the same components but with a slight difference. The root of the implant is made of state-of-the-art titanium, a biocompatible material that naturally bonds with your jaw bone. Once the implant is placed then a custom-made crown is placed on top to restore your chewing and speaking capabilities. 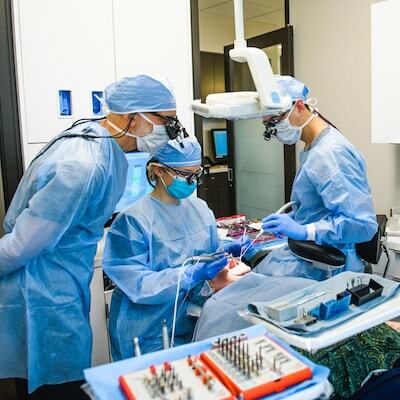 Dr. Pasquinelli and Dr. Olivares have enjoyed advanced training, allowing them to perform the actual implant surgery, initial tooth extractions, and bone grafting if necessary. They work alongside oral and maxillofacial surgeons and your restorative dentist. Considering dental implants in San Francisco? We offer a range of treatment options to restore your smile's function. One or multiple missing teeth can have a real impact on your bite, speech, and even your whole health. It is not just your health that is affected, your appearance suffers too because a missing tooth can result in your jaw rapidly deteriorating by up to 25% in the first year alone. Dental implants are an ideal solution as they look and act just like natural teeth. There are a number of different implant options to boost your oral health and appearance. Hover over each image to learn more. Dental implants provide a strong foundation for replacement teeth and are a great permanent solution to missing teeth. Our dental implant specialists, Dr. Pasquinelli and Dr. Olivares use single-stage implants to support individual teeth or even dentures. These implants can be placed comfortably and precisely in just a few visits. The results are stable, durable and long-lasting. 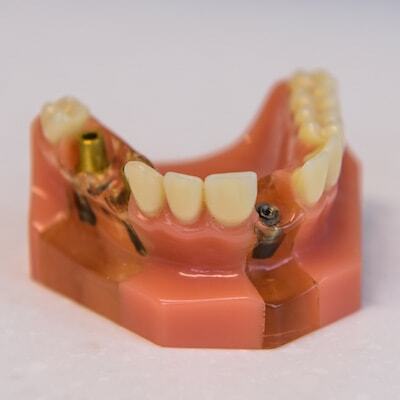 Metal or plastic partial dentures are a more robust option. These are removable for your convenience and are held into place by wire clips. 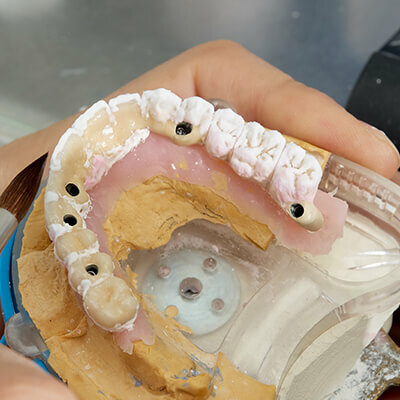 This type of restoration consists of two crowns bonded either side of a replacement tooth. The connected set of teeth is bonded to your natural teeth adjacent to the missing tooth. The extra teeth hold the restoration in place and provide a natural looking finish. 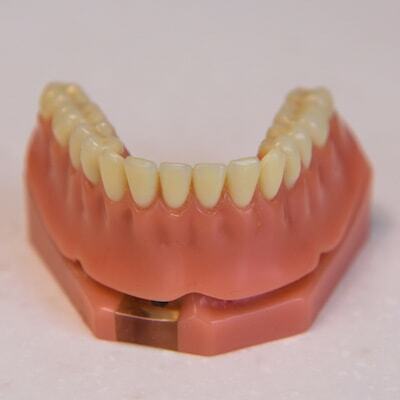 For people with all their teeth missing, a traditional denture is a very effective option. The denture is designed to fit the upper or lower arch of your jaw and be permanently placed on top of dental implants. How Are Dental Implants in San Francisco Placed? Here is a basic overview of this effective and efficient surgical procedure. Before your dental implant procedure, your periodontist in San Francisco administers a local anesthetic to the area. We also offer sedation options and antibiotics for those who are nervous. IV sedation and nitrous oxide are available to make you feel more relaxed and comfortable. The procedure only begins when you are 100% comfortable. Dr. Pasquinelli or Dr. Olivares starts by making a small incision to reveal the jaw bone. They then gently create space and insert the dental implant post. For some people, the dental implant can be restored during the same appointment, but for the majority, the bone and gums need time to heal. Your oral surgeon will assess your healing time with you and arrange your follow-up appointment. Our experts aim to take impressions once the implant is placed so they can begin designing the crown. Once the implant is healed, we place the custom-made crown on top and restore your smile. Typically the implant procedure takes 30-60 minutes for a single implant or up to three hours for multiple implants. Each patient is different, so the treatment time and healing period will vary. 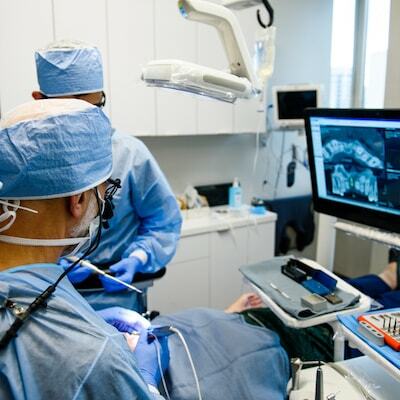 However, each patient is treated with the utmost care and each implant is placed with the greatest precision. I was lucky enough to find Dr. Pasquinelli. It was definitely a long process given the complexity of my case, but I really appreciated the fact that he didn't try to rush it, but recommended an approach that would provide the highest likelihood of success over the long term. When you lose a tooth through an extraction, our implant dentists in San Francisco evaluate the thickness of the walls of your tooth socket. If the walls are too thin then a bone graft is often placed to help your body fill in the empty socket with bone. This step will maintain the width and volume of bone you will need for implant placement several months later. If your tooth has been missing for many years, there may be inadequate bone. This can be corrected with a bone graft being placed next to the thin bone then leaving some time for it to heal. During this time, the graft fuses with your bone and the ridge can be re-entered and the implant placed. Sinus cavities that are large or low can interfere with implants. When this happens bone grafting can be used to elevate the membrane that lines the sinus. Next, the bone restores the height and provides adequate room for an implant to be placed. Consider these questions if you are thinking about getting dental implants. Less expensive restorative procedures such as a denture or dental bridge require repair or replacing every 5-10 years, whereas modern dental implants are state-of-the-art and can last a lifetime with proper care and maintenance. So they actually provide an effective time-saving and money-saving solution. Around 98% of patients have found success with dental implants due to their stability and longevity. They mimic your natural teeth and thus restore your natural functions, e.g. chewing and speaking. Our implant dentists offer a variety of options to meet your specific needs. First, check with your dental insurance carrier to see what portion, if any, of dental implants they cover. There are healthcare credit companies that offer no-interest and low-interest loans for medical procedures, including dental implants. As each patient is different, there may be variations in time and cost. The titanium post of a dental implant is biocompatible, which means your body welcomes it. This material fully integrates with your jaw bone and stimulates bone growth. Titanium is strong and durable so it helps reduce the risk of future dental problems. The time for healing and placement varies from patient to patient and treatment to treatment. After the preparation phase, Dr. Pasquinelli or Dr. Olivares allows time for your bone to heal and fuse with the implant. In some cases, a temporary replacement tooth can be attached during the same treatment. But most people require some healing time. Enjoy a restored smile with the number one solution for missing teeth.